Windows 7 Keyboard Shortcuts, Windows Explorer Keyboard Shortcuts for Windows 7 PC !! Most of us are well familiar with Windows 7 General Keyboard Shortcuts because we have been habituated to use these Keyboard Shortcuts on Windows 7 PC. 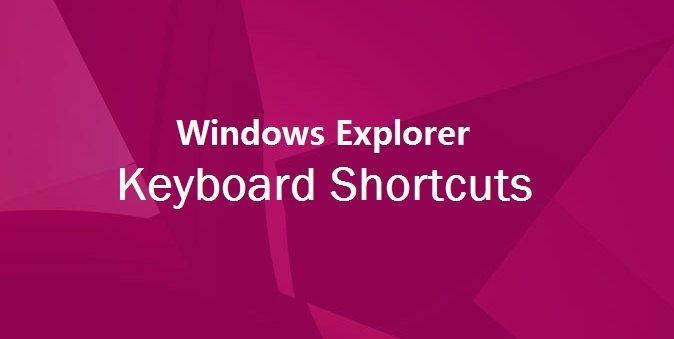 In case, you spend your lots of time in browsing internet or your work is related to using several web pages and you want to do your work quickly then you will have to use Windows explorer keyboard shortcuts. With the use of Windows explorer keyboard shortcuts, you may complete your task in half time and your work productivity will be just double. Here, we are mentioning some best and most useful internet explorer keyboard shortcuts for Windows 7 operating system and hope it will help you so much. Feel free to share your view with us though the comments. You may also write your choice (which type or what information you want to get), We will try to publish as soon as possible. To get more ultimate Windows Help tutorials, click here ! !